"In late 2013, when I decided to start putting real effort into organizing more combat tournaments at juggling conventions, I only had vague notions of what "success" would look like. "Previously, there were only two or three Fight Nights per year, dependent mostly on whether Bob Carr or I happened to be at a juggling convention. My general goal was to increase that number. I had a lot of fun taking part in the tournaments so, selfishly, I wanted to take part in more. More importantly, because I knew how fun it was to take part, I wanted more jugglers to have the same opportunity, rather than just the usual handful of Berlin jugglers who knew where and when to be, and who would get an invite into the tournament. "Three other interests of mine came together in this project too. First, I really enjoy organizing events and doing interesting things for other jugglers (see: British Young Juggler of the Year, Top 40 Jugglers, etc). Second, I'm a sports fan and, along with watching the action, I really enjoy following results and statistics. Third, I wanted to learn more programming and website development. "So I created the rankings system, initially based on the ATP tennis rankings, and started up the website. More importantly, I set about developing a general tournament format that anyone could copy, and that would result in a (hopefully) interesting and entertaining event to put in their convention schedule. For all of this I got invaluable feedback from many other jugglers, too many to mention or thank here, but throughout the last few years everything has continued to improve. "To return to my initial question, what I would consider a success, whatever I thought at the time has been totally surpassed. I remember being excited that anyone but Bob or I would organize a tournament, and care enough to sent in the results. Then I thought it would be cool if there were 15 regular tournaments per year after a few years. But that number was surpassed in the first year. So at the start of 2015 I stopped aiming for or expecting anything, and just let other people organize whatever they want. "Personally, in 2015 I've enjoyed being invited to juggling conventions: "Would you like to run the Fight Night? Oh yeah, also an act for the gala show would be nice." In the past I'd be invited for shows and workshops, but now for me and a few other jugglers I know, Fight Night is becoming a main reason to be invited to a convention as a guest. "Also I really enjoyed organizing the European Masters here in Berlin. It's the first combat-only event I've organized, not as part of a juggling convention, that had the funds to fly in participants from other countries. Money from viral YouTube videos and licensing deals helped pay for a really fun event!" 2012: 18 jugglers took part in 3 tournaments. 2013: 54 jugglers took part in 10 tournaments. 2014: 215 jugglers took part in 23 tournaments. 2015: 358 jugglers took part in 40 tournaments. In 2015, the total number of players in the results database passed 500, from 28 different countries. Let's look at 2015 more closely. Only one juggler qualified for more than one tournament and won all their knockout matches: Emil Dahl, winning 7 out 7 matches in Lublin and Israel. Jochen Pfeiffer has the second best winning percentage, at 86%, with 13 wins and 2 losses. A number of other jugglers also have a greater than 80% winning percentage, including Iver Tronstad, Stefan Braun, Eóin Allan, and Luke Burrage. Luke leads in total matches won, with 30 wins at 10 tournaments. Dave Leahy and Eóin Allan each won 15 matches, Jon Peat 14, Jochen Pfeiffer 13 and Brook Roberts 12. Luke's 10 tournaments is also the highest number of any player in 2015, with Jochen Hänsel taking part in nine, and six other jugglers taking part in eight each. Finally, Luke leads in terms of tournaments won, with five titles. Andreas Braun and Jochen Pfeiffer each have three titles, and five others each have two titles. There were 27 different tournament winners in 2015, and this year also saw the first female Fight Night champion, with Friederike Kraaz winning the Suderburg tournament. There are some interesting metrics to show that 2015 was a more balanced year at the top of the rankings than 2014. In 2014, Jochen Pfeiffer dominated at the biggest tournaments, was ranked number 1 for the entire year, and went undefeated too. In 2015, Jochen won only two 500+ level tournaments (Hamburg and Brianza). Eóin Allan took the EJC title and won the European Masters. Luke Burrage won the at NJF and Iver Tronstad won at the BJC. Jochen was replaced as the number one player in the rankings after losing in the round of eight at the EJC, and slipped down to third after Eóin Allan won the European Masters, the final tournament of the year. In 2014, no juggler beat a number one ranked player. In 2015, five jugglers beat a number one ranked player. Luke Burrage and Florian Marienfeld both defeated Jochen Pfeiffer, while in the second half of the year, Jochen Pfeiffer, Eóin Allan and Alexander Müller beat Luke. Luke leads in the "wins vs top 10 players" metric, with eight, Eóin is second with seven. Jochen is third with six wins vs top 10 players, though he would have more had he taken part in the European Masters. There are three different ways to determine the biggest tournament of 2015. By sheer number of players, the EJC wins out easily, with 70 participants. By participation level, which is a weighted measurement taking into account top 25 players in the tournament, the NJF was the hardest tournament to win, with a participation level of 6.09, higher than the 5.93 of the EJC and the European Masters. However, the European Masters had the highest concentration of top players. If the participation level was divided by the number of jugglers who qualified for the tournament, the EJC would be at 0.37, the NJF slightly ahead at 0.38, and the European Masters would lead at 0.59. The longest winning streak in 2015 is currently unbroken. Eóin Allan has accumulated 1515 points over 12 matches at the EJC and European Masters. Luke Burrage has the second longest winning streak this year, at eight matches, an extension of a streak that began in 2014 for a total of 14 matches. Emil Dahl has a currently unbroken winning streak of seven matches. Jochen Pfeiffer, Dave Leahy, Brook Roberts and Jakub Szwed all put together six match wins in a row, with Jochen's coming as part of a 28 match winning streak going back to 2013. This year there have been 34 Fight Night Combat videos posted on YouTube. The most popular was Til vs Luke at the EJC, with just under 40,000 views. That's it for 2015! There will be another post about what's changing for the 2016 season of Fight Night Combat in the new year. Congratulations to Eóin Allan for winning the European Masters 2015 tournament yesterday in Berlin. 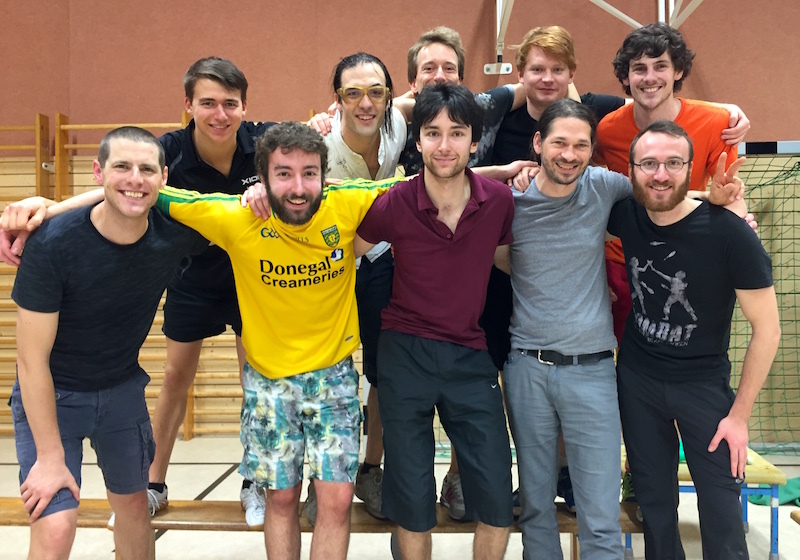 Ten of the top 15 ranked jugglers of the 2015 Fight Night Combat season took part, each flying in from the UK, traveling across Germany, or just taking the Ubahn across the city from their home. The invite-only selection of players with such high ranks made this the strongest field of players in any tournament so far. While not part of a convention, roughly 50 other people turned up to support the event, spectate, and cheer on their favorite players. And for the whole evening Maarten Wils hosted a live video stream of the event, with viewers from all around the world following the action at home. Each juggler played four three-set matches in two groups, with these matches counting the same as knockout matches for record keeping purposes. Eóin went undefeated in his group matches and the knockout stage, and adding this to his win at the EJC 2015 in Bruneck, he now has the third longest and second most valuable winning streak on record, 12 matches in a row. Also, due to so many matches among top players, Eóin and Luke Burrage now lead the list of most wins vs top 10 players in 2015. Eóin beat Luke in the European Masters semi-final, along with his win in the EJC final, to bring their head-to-head record to 2-1 in his favor. Finally, by winning all his matches at the European Masters, Eóin passes Jochen Pfeiffer in both the 2015 end-of-year rankings and the current 52 week rankings; Eóin is now second and Jochen third. Dave Leahy lost to Eóin in the group stage, but then defeated Alex Leymann and Florian Marienfeld in the knockout stage to face Eóin again in the final. Dave earned himself 260 rankings points and remains at 4th place in the rankings. By winning more group stage matches than Dave, Luke Burrage managed to earn 270 points, 10 more than Dave, with his third place finish. Florian Marienfled, who lost in the third place match, only just scraped into the knockout stage on the third tie breaking metric (points difference) at the bottom of Group B, but immediately beat Alexander Müller, the undefeated winner of Group A. Other notable performances included those by Julius Preu, who registered his first two wins versus current top 10 players, and Brook Roberts, the only player to reach match point against Eóin in the entire tournament. Jochen Hänsel, Jon Peat and Alex Leymann all won one group stage match to earn themselves 50 rankings points each. Thanks to all involved in running the tournament! Keep an eye out for a highlights video featuring all the best moments from the European Masters, which should be upload in about 10 days. On Saturday December 5th, at 4pm, the Fight Night Combat European Masters 2015 kicks off in Berlin. That's at 3pm GMT and 10am EST. Why are we sharing the times around the world? Because you'll be able to follow along at home! 1. The live scores page will update after every match. It also shows up-to-the-minute group standings and knockout brackets, and live rankings calculations to show who still has a chance to improve on their 2015 rank. 2. A live video stream from the tournament, hosted by Maarten Wils, will show all the action from the tournament, as well as commentary, discussion, and interviews with the players and organizers, and more. 3. Updates will be posted to the new FNC Twitter account, @FNCombat. This will also be the best way to send questions, comments, and feedback to the tournament hosts and organizers.